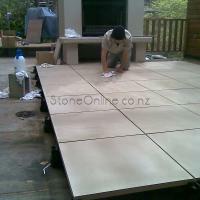 Specialised pedestal or deck jack flooring is now the norm for exterior decks that are over living areas. 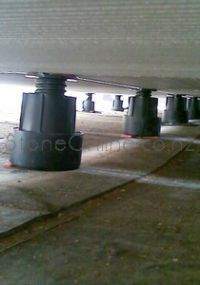 In Australia the pedestals are refered to as 'chairs' and there are many names and companies that supply the jacks. Councils have made it manditory that stone must be installed in a way that it can be pulled back up if the decks waterproofing leaks. StoneOnline has a simple range of durable and attractive stones that we've used very successfully, and they are at exceptionally good prices.